A set of the Borderlands 2 and Borderlands: The Pre-Sequel! Reeditions with all of their expansions. 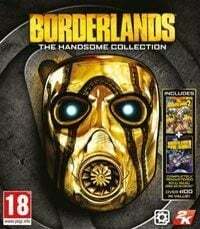 Borderlands: The Handsome Collection is a bundle developed with the 8th-generation consoles in mind. Borderlands: The Handsome Collection is a bundle release of the reeditions of Borderlands: The Pre-Sequel! and Borderlands 2. Both remasters were developed by GearBox Software again. Borderlands: The Handsome Collection does not change anything in the plot and gameplay mechanics of both games it includes. The action takes place on the planet of Pandora and its moon again, where fame-hungry heroes wade through hordes of enemies. The main goal is not only to perform quests but also to collect the best equipment that is profusely dropped by defeated foes. In total, both titles offer 8 playable character classes (four per game) that are different not only in terms of appearance but of skills and development tree, as well. In The Handsome Collection, both Borderlands 2 and Borderlands: The Pre-Sequel! received significantly enhanced graphics and smoother character animation. The games are additionally enriched with an expanded cooperative mode that allows up to four players to play on one screen. The PlayStation 4 version offers the possibility to import our save games from the separate PlayStation 4 or PlayStation Vita editions and to continue playing with them. The bundle includes not only the vanilla versions of Borderlands 2 and Borderlands: The Pre-Sequel! but also every DLC they have received, including those not yet out at the launch of the reeditions.